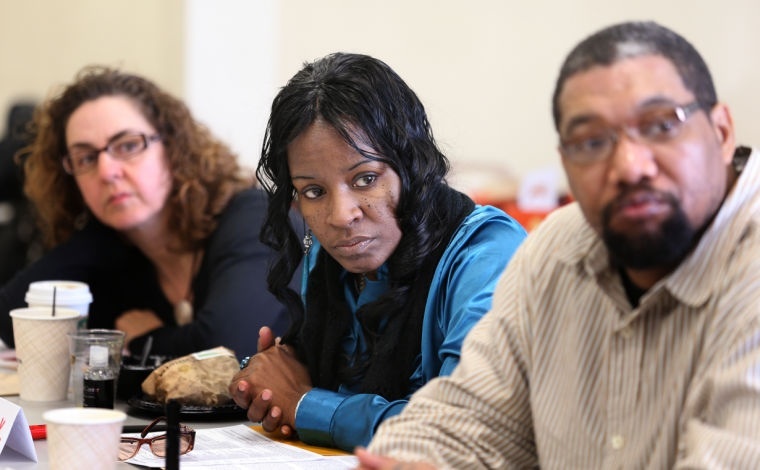 Top: From left, Andrea Robles, Brenda Kenney and Marco Thomas listen to other members of the Engaging Richmond team during planning focused on improving the lives and health of East End residents. Keandra Holloway and her three young children live in Fairfield Court public housing in Richmond’s East End. She is grateful to have a home but feels like the community has been forsaken. Services most communities take for granted are absent. There are numerous corner markets but only one grocery store. When she needs to buy milk, broccoli or the fruit snacks her children like, she drives to Mechanicsville. When her children want to play outdoors, she drives them to a park outside the neighborhood. “My neighbors tell me all the time, ‘Let the kids come outside,’" Holloway said. Her apartment is just a few doors down, within yelling distance really, of a playground where her children, Jayandre, 6, Jermiah, 5, and Wionna, 2, could play. “But we will get in the car and go,” she said. At the same time, Holloway feels a little insulted when people from outside the neighborhood make it obvious how they feel about where she lives. “I see cars, people who may be lost. Before they enter the neighborhood, they do a complete U-turn. It’s like wow. What do people think about us?” she said. Fairfield Court is one of several large housing projects Richmond Redevelopment and Housing Authority officials are talking about demolishing and replacing with less-dense, mixed-income housing. Such redevelopment would take years and cost millions, and in the end would not provide homes for all who live there now. Regardless of what the city or RRHA does about Fairfield Court, Holloway, 23, who works full time at a check-cashing business and who has been putting in extra hours lately, hopes to move. There is a socioeconomic case to be made for dismantling the projects — with the high rates of poverty and joblessness and high rates of people who do not finish high school, circumstances that often get passed down through generations like bad genes. There is also a public health case for change. If Holloway and her children were to remain where they are for the duration of their lives, they likely would develop more illness and die younger than residents of other neighborhoods in the region. Average life expectancy for someone who is born and remains their entire life in the census tract where Holloway lives is just 66 years — almost 13 years less than the average U.S. life expectancy of 78.7 years. And almost 20 years less than someone who lives in the city’s more affluent neighborhoods in the West End, where average life expectancy is as high as 83 years. There is no single cause for the differences in life expectancy. Rather, there are multiple factors, most of them beyond what the medical community is set up to tackle. Some public health experts call the factors the social determinants of health — things that affect a person’s ability or desire to maintain health or pursue it. They include access to medical care but also factors such as quality of schools and individual educational attainment, income and employment and environmental exposures, such as lead and air pollution, and even landscapes, such as whether neighborhoods have sidewalks, bike paths and trees and if those places are viewed as safe. The East End has “some of the most negative health outcomes; too many people literally dying too early, too often from very preventable or treatable health conditions,” said Councilwoman Cynthia I. Newbille, who shortly after taking office in 2009 launched a health and wellness initiative for the 7th District, which includes Fairfield Court and Creighton Court public housing. The grant-funded initiative has three focus areas: health education and outreach; health promotion; and screening, treatment and medical homes that coordinate a patient’s care. A list of collaborating partners is long — churches, the city health department, Bon Secours Richmond Health System, doctors in private practice, the Vernon J. Harris Health Center, Virginia Commonwealth University, the Minority Health Consortium and others. There is a pastors’ consortium, and one pastor launched a 500-pound weight-loss challenge among his congregation, Newbille said, giving an example of the types of activities occurring. There are exercise classes, walking groups and health fairs, things that ask people to take personal responsibility for their health and wellness. Tougher, though, is addressing problems that get at the dearth of resources. Residents want a bigger grocery store, but that is proving difficult to make happen. In the meantime, Newbille said the 7th District Health and Wellness Initiative just got a small grant to get corner markets to add more healthy items, such as fruits and vegetables. “It’s one thing not to know. It’s unconscionable to know and not try to do something,” said Newbille, who grew up in Whitcomb Court, a public housing project in the neighboring 6th District. “I had the opportunity to get a scholarship, went away to college and came back,” she said. “This is a community I care about." “What I refuse to do is allow the enormity of it to preclude me from … strategically working on it,” she said of transforming the East End. Holloway is taking a similar step-by-step approach. This time last year, she was wondering how she could get anywhere without a high school diploma. “Miss Sandra really helped me,” Holloway said, referring to Sandra Bosher, the resource center specialist at the Fairfield Court Resource Center. “I told Miss Sandra I wanted to move. I wanted a different job,” said Holloway, who used to work as a cashier at a convenience store. “But who’s going to hire me. People with degrees can’t get jobs. Miss Sandra motivated me. She was like, take it one step at a time. I prayed on it and prayed on it. I just started filling out applications.” Holloway said she passed the GED tests, and Bosher helped her write a résumé so she could apply for better-paying jobs. There have been setbacks, such as losing a day-care subsidy that stopped without warning. Her goal now is to go to college to get an associate degree. “I want to run my own business for young girls, counseling, somewhere for them to go. Instead of running the streets, for girls to know they are still loved,” Holloway said.